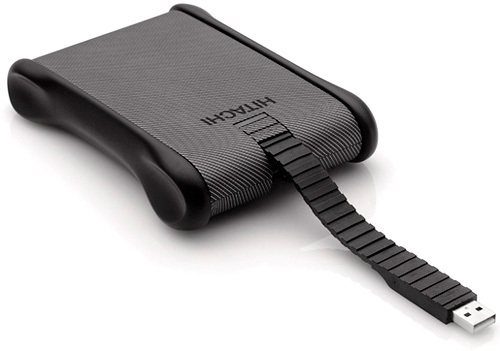 Hitachi SimpleTOUGH External Drives | OhGizmo! By Andrew Liszewski on 07/15/09 • Leave a comment! On Monday Hitachi Global Storage Technologies announced a bunch of new storage devices and accessories like the SimpleNet box Evan brought you yesterday, and these slick looking SimpleTOUGH portable drives. But they’re not only about looks. The drive is billed as “one of the world’s most rugged drives for protecting data in harsh environments” and it’s not only water-resistant, but it can also survive a drop of almost 10 feet. I particularly like the integrated foldaway USB cable which means you never end up in the situation where you desperately need a file off the drive, but have neglected to pack the appropriate cabling. The SimpleTOUGH drives will be available in 3 sizes, 250GB for $99.99, 320GB for $119.99 and 500GB for $149.99.